I've yet to read one of his books, but boy do I want to!!! Great interview guys. Thanks for doing the interview Susan! Thanks for bringing us this interview, Susan. And thanks Mike for sharing your experience with us! I got your book for my husband not too long ago, so I get to read it after he's done :D Have a great day! If you've ever read Kathryn Mackel's books, you'll like Mike's style. It's beyond chilling. Great! Did you know both of Mike's books have gone into a second printing? I know you'll enjoy them. Great interview and his book looks fabulous! I will definitely put it on my wish list! I love how he said we are all hypocrites and that element shows a level of humanness. Yes! So true! I also thought his comment about hypocrisy brought out a good point. 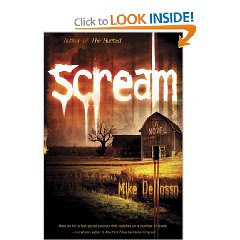 I love supernatural suspense, fantasy and sci fi, so I am really interested in reading Mike's books. One of the first manuscripts I worked on as an editor/book doc was a fantasy,so it is a genre close to my heart. Great questions, Susan! And I loved learning more about Mike Delloso.Thanks! If you love supernatural suspense, you'll love Mike's books. There are several scenes from, "The Hunted," that I still think about. I am reading his book now--that one. He is very good!! I'm sure Mike will be happy to hear you're reading his book. The second one, "Scream," is on my Wish List. "Darlington" sounds tantalizing. That line about a town where fear has teeth...there's a hook if I ever heard one! Thanks for your prayers. Tomorrow is my last day. Part of me still can't quite believe it. I like Mike's character discussion. If I were reading the book, I would appreciate a character who acts human - in many different ways. I don't care for Christian fiction where the main character (expecially if it's an old lady) is perfect. I also received much food for thought about characters. No matter how much we love the Lord, we all have times when we blow it. Our characters need to reflect this reality. There's an old book called, "Elsie Dinsmore," that I read as a child. She was the perfect little girl...and totally plastic.